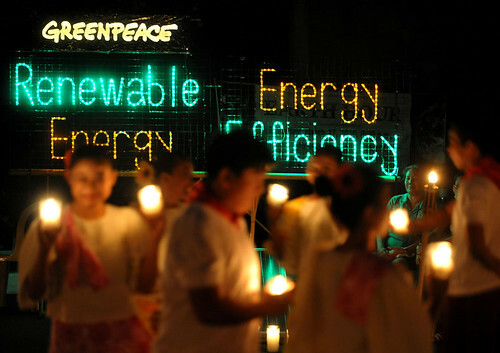 Last Saturday’s Earth Hour solidarity event that Greenpeace commemorated with the Malate Church’s Care for the Earth Ministry, the Great Work Movement, Solar Generation Pilipinas and the neighboring parishes, barangays and inter-faith groups was a solemn and yet joyous occasion for the hundreds of people who came to the event. The day started at 4PMwhen the groups from the parish went around the communities encouraging everyone to turn off their lights at the designated time. It wasn’t until at 7PM when program began with ecumenical prayers and choir music from the 5 different religions that were present. As the 8:30PM lights-out approached we were given a time contemplate on the event’s significance while listening the ecstatic drumming of indigenous instruments that slowly faded out as the lights were switched off. After two minutes of quiet reflection, the LED lights that read “Renewable Energy, Energy Efficiency” in a 3 x 10 foot frame was switched on. Musing about this now takes me to the value and use of symbols as a means of deconstructing how one is lead into a deconstruction and reorientation of reality. Culturally, light and darkness traditionally symbolize the dichotomy of good and evil, as they are often metaphorically related to black and white and day and night. 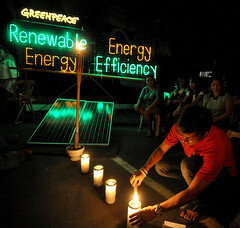 It was in the midst of darkness that light, albeit from a solar-powered installation of LED lights that visualized our aspiration for an Energy [R]evolution that involves a two-pronged approach: a shift to Renewable Energy (RE) at the production side; and the propagation of Energy Efficiency (EE) measures at the user end. Here the darkness of a world wedged in a climate crisis was gleamed with the light of a solution that can be found in RE and EE. 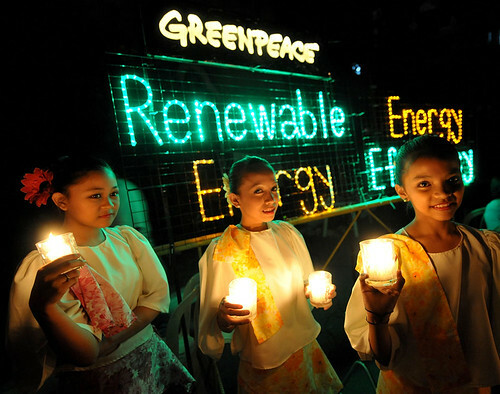 Slowly, the torches and candles that formed a ring in the staging area were lit and for that hour, there was just dancing to the enchanting tune Philippine folk dances and indigenous dances from Mindanao and the Cordilleras. The group Lakbay Lahi, took the drumming to a climax with the whole community dancing as we neared the end of the 60 minutes. It was sheer joy to be one with the community with a common understanding on what is happening and what needs to be done. By the time lights came back on, Beau our campaigner on the event gave a short spiel on the symbolism of Earth Hour since the event highlights the act turning-off of lights for an hour as the individual’s representational contribution to lessening the use of fossil fuels, furthermore she reiterated the need to push more aggressively the vision of an Energy [R]evolution. The event was then closed by Fr. John Leydon, the parish priest of Malate Church talked about the need to change individual lifestyles to allow the earth more breathing space. Thus the symbolic switch points towards a call for a resolution for a sustained and conscious effort to become real agents of hope in this struggle against climate change. As switching off is a good start. But it is only insurmountable if the inspiring feeling that we all had during that night would be translated into daily actions that would be our individual contribution to the global movement that’s dedicated to combating the climate threat. Sharing good health to your hands. We expect to continue ..
poststory.freenice.org is a place to read, publish and promote articles from around the web. From business to sports, make your mark on the web.